At last week’s virtual #Rally4Babies, policy leaders, government officials, and celebrities all showed support for increased investments in services to help the nation’s infants and toddlers get the right start in life, including Early Head Start, quality child care, and home visiting. The event, hosted by ZERO TO THREE and a number of other organizations, was held via Google+ hangout, and participants around the country could join up on-line to watch. Among the statistics cited to make the case for the importance of starting early was the dramatic difference in vocabulary between more and less advantaged children by age three. Economically advantaged children know 1,100 words by age three, but economically disadvantaged children know only 500 words by that age. 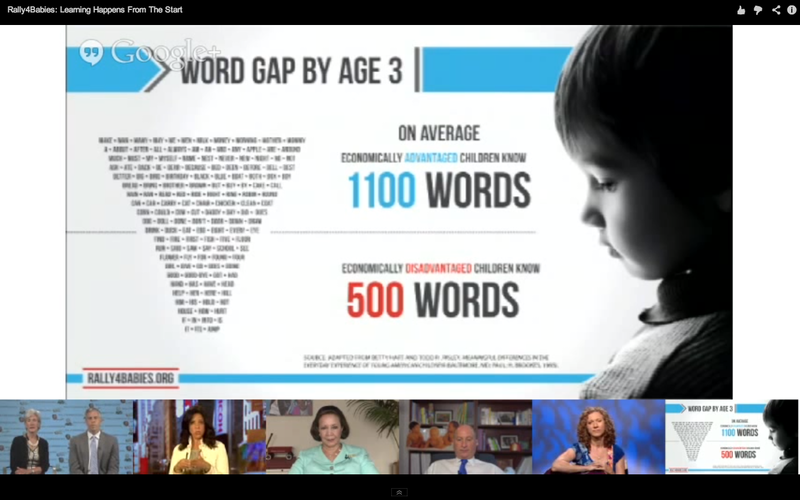 This word gap is stark, with economically advantaged toddlers having twice the vocabulary of toddlers in poverty. This statistic comes from a classic study by Hart and Risley, published in 1995. If you are unfamiliar with the study, it is worth a look, providing a rich, detailed data set that documents how different trajectories in language development begin and unfold. (Here are two articles summarizing its key findings: an excerpt from their book, and Todd Risley’s article). This study observed 42 families for an hour each month for nearly 2 1/2 years, recording the interactions between children and parents, yielding over 1300 hours of interactions that were then carefully studied and coded. The study started when babies were 7 to 9 months old and followed them until they turned three. We know that the goal of having children reading at grade level by the third grade is a hot policy topic, and a policy priority supported by 19 governors, according the the Campaign for Grade Level Reading. 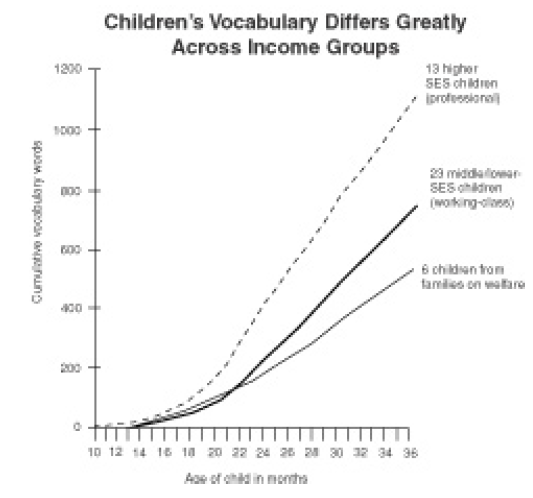 The dramatic vocabulary gap documented by Hart and Risley shows just how critical the earliest years are for laying the foundations of language learning and literacy. Hart and Risley’s team followed up on children’s language skills in third grade and found that children’s vocabulary at age three was indeed a strong predictor of later vocabulary and reading in third grade. To reach the goal of on-target third grade reading, start with babies. As Secretary of Education Arne Duncan said at the Rally4Babies, we need to get out of the catch-up game. It is much harder to help children catch up who have already fallen behind in their vocabulary and pre-reading skills; it is so much more effective to provide a rich and supportive environment for learning from the start. Those supports include high-quality early learning and home visitation services for at-risk children and families.